A visit to Pearl Harbor reminds those of my generation of how many of us first heard about these small islands stuck in the middle of the Pacific Ocean. It was here, almost 70 years ago, that World War II began for the United States when, on that ill-fated Sunday morning of December 7, 1941, the Japanese attacked the U.S. Pacific Fleet at anchored at Pearl Harbor and numerous other Hawaiian military installations. It was our parents and grandparents who fought in the war, either overseas against the forces of tyranny or by doing their share on the home front. Fewer veterans of World War II survive with each passing year. It is now our duty to remember their sacrifices to preserve our freedom. The decision to berth the USS Missouri or "Mighty Mo," as she is often called, in Pearl Harbor within a ship's length of the USS Arizona Memorial was not without opposition. There were those who felt (and still feel) that the massive battleship overshadows the solemn memorial to those men who died on the Sunday morning so many years ago. It was no easy fight to bring the "Mighty Mo" to Pearl. Strong campaigns were waged by Bremerton, Washington and San Francisco to win the last battle in which the Missouri was to be involved. For this writer, the choice of Pearl Harbor to be the permanent home of the ship was the correct and only logical one. The USS Missouri and USS Arizona Memorials serve as bookends marking the beginning and end of the U.S. involvement on the Second World War. It was on the USS Missouri that the "Instrument of Formal Surrender of Japan to the Allied Powers" was signed by representatives of the allied nations and the government of Japan in Tokyo Bay on September 2, 1945. The illustrious history of the Battleship Missouri, however, is much more than just the place where that document was signed. The USS Missouri was built at the New York Navy Yard in Brooklyn, New York. Her keel was laid on 6 January 1941. She was christened and launched a little over three years later, on 29 January 1944 and commissioned on June 11, 1944. She was the final of four Iowa-class battleships commissioned by the United States Navy and the last battleship ever to join the fleet. The ship was christened at her launching by Mary Margaret Truman, daughter of the future President, Harry S. Truman, who was at that time a senator from the state of Missouri. She will be forever known as "Harry Truman's ship." Following her commissioning she was quickly sent to the Pacific Theater where she fought in the battles of Iwo Jima and Okinawa and shelled the Japanese home islands. It was at Okinawa that she was struck by a Japanese Kamikaze pilot. Signs of the impact still appear on her side near the deck. The Missouri fought in the Korean War from 1950 to 1953 and was then decommissioned in 1955 into the United States Navy reserve fleets (the "Mothball Fleet"), but reactivated and modernized in 1984 as part of the 600-ship Navy plan, and fought in the 1991 Gulf War. Missouri received a total of eleven battle stars for service in World War II, Korea, and the Persian Gulf, and was finally decommissioned on 31 March 1992, but remained on the Naval Vessel Register until her name was struck in January 1995. In 1998 she was donated to the USS Missouri Memorial Association and began her journey to Pearl Harbor where she is docked today at Ford Island, just a short distance from the USS Arizona Memorial. The best time to visit the Missouri is early morning - by doing so you can avoid the organized tour buses. The Battleship Missouri Memorial opens at 8:00 a.m. and the Memorial is open until 4:00 or 5:00 p.m. depending on the time of year. Tickets can be purchased at the ticket window of the USS Bowfin Submarine Museum and Park on the opposite side of the parking lot from the USS Arizona Memorial Visitor Center. You can also order tickets online in advance. The Memorial is a not-for-profit venture, which receives no public financing. Despite its location next to the USS Arizona Memorial, Mighty Mo is not part of the U.S. National Park, hence an entry fee is charged to defray operating costs. There are numerous ticket options available including package tickets which entitle you to visit all three of the Pearl Harbor Historic Sites: the Battleship Missouri Memorial, the USS Bowfin Submarine Museum and Park and the Pacific Aviation Museum. All three are well worth visiting. Guided tours are available on the Battleship Missouri. The tour options change frequently, so be sure to check their website for details. You can also purchase a ticket that will allow you admission to all three of the Pearl Harbor Historic Sites. 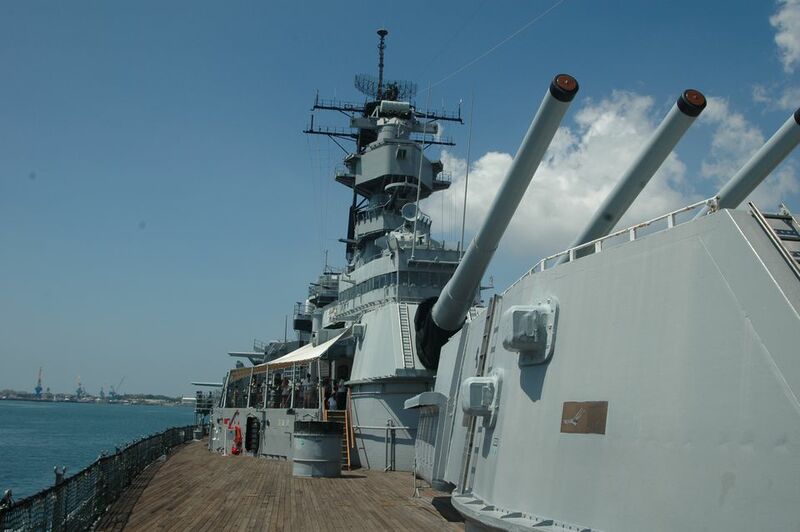 A short bus ride across the bridge to Ford Island brings you to the Battleship Missouri. Following your tour you are welcome to explore areas of the ship not covered on the tour but still accessible to the public. More parts of the ship are opened every year, as funding allows areas to be brought up to current OSHA standards. If you plan to visit the Battleship Missouri, allow at least three to three and a half hours, including drive time from Waikiki. I recommend that you devote an entire day to historic Pearl Harbor and visit all three of the Pearl Harbor Historic Sites as well as the USS Arizona Memorial.